Don't conduct work for your own business while you're on the clock for another employer. When starting a business while working, balance your moonlighting with the "daylighting." (CareerBuilder.com) -- If you're thinking about entrepreneurship, you've probably heard that you should start your business before you quit your day job. It's good advice, but not always practical. Depending on how many hours you have to put in at work, you may have very little time left for your business. The catch is that if you want to be a full-time business owner, you have to build up your business so that you'll still be able to pay your bills. It can be hard to give up the security of a regular paycheck to pursue your dream of being an entrepreneur. How can you balance being an employee while you're moonlighting? For one thing, you might not want your boss to know that you have something else on the side. You don't want to appear to be expendable or less dedicated. Keep your business under wraps as much as possible. That also means you shouldn't conduct your business at work, no matter how tempted you may be to bring your side business to your workplace. And with computer use monitoring becoming more pervasive in the workplace, you probably won't have much privacy if you're using company equipment for personal use. If your goal is to leave your job and run your business, here are some steps you should follow. 1. Pick a date for when you'd like to make the move into running your business full time. Be realistic when you look at the calendar. The date has to feel comfortable and be something that you think you can do. 2. Check your spending. How much money do you need for your business and for personal expenses? It may be tempting to continue to spend money because it's regularly coming in, but once you're no longer an employee, you won't have that income. 3. Start paying down debt if you can. Set up a payment plan for your credit cards. 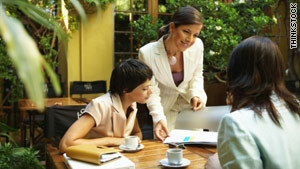 Create a budget for business expenses as well. 4. Get ready to spend more time alone. If your business is home-based, you won't have the office co-workers around. Start networking now so that you can have a support system before you leave your job. 5. Get a plan together for what you want to accomplish in your business. Whether you use a business plan or a mission statement, have a clear idea of what your business is about and why you're doing it. It's not enough to go into business because you don't want to work for someone else. Know what you're getting into before you leave your day job. For some people, having a side business is part of a long-term plan, not an interim step. If you aren't looking to leave your regular job, it's less about growing your business than maintaining it. Here are some ways to balance the moonlighting with the "daylighting." 1. Set boundaries. Your clients may want more of your time, but your priority is your day job. Let them know what your business hours are and stick to them. If you end up working long nights, you won't have the energy to accomplish what's required on your job. You don't want to put your steady paycheck into jeopardy because you're not getting things done. 2. Be careful about how you use social media. In some cases, employers are checking up on what their employees are doing online. Depending on what type of business you have, promoting your side business on your social media profile may raise red flags. For instance, if what you do on the job is similar to what you're doing in your business, you don't want to appear to be in competition. 3. Extra money coming in from a side business can be a great supplement to your income. Resist the temptation to spend more because you're making more money. Unless your business income is targeted for a specific purpose, you can end up spending it as fast as it comes in. Don't put yourself in a position where the money is going out faster than it's coming in -- you may have to work harder at work and in your business to keep up the momentum. Deborah A. Bailey is the author of "Think Like an Entrepreneur: Transforming Your Career and Taking Charge of Your Life" and a sought-after expert to discuss today's most pressing workplace issues.